Former film colleagues celebrated the work of production designer Sir Ken Adam, who created some of the grandest illusions in the history of cinema. In the year of his 90th birthday, friends, family and devoted colleagues of Sir Ken Adam gathered at the Royal Institute of British Architects in London for an evening of tribute speeches in celebration of the esteemed production designer. Broadcaster and presenter Matthew Sweet reviewed Adam's extraordinary career, before both Adam and his wife Lady Letizia Adam were invited onto the stage to be presented with a Special Award in recognition of his outstanding career in film. Former collaborators and collaborators including Lewis Gilbert, Michael G Wilson and Christiane Kubrick also shared their memories and admiration for his incredible work. Speaking of the evening as a whole Adam said “it made me want to do more films”. When you do a scribble and everything seems to work…that is the most exciting part. That is when you know you’ve done something interesting. Adam’s career began in the late 1940s studio era and flourished for well over half a century. He was responsible for some of the grandest illusions in the history of cinema; in his tribute to Adam, Sir Roger Moore likened walking into one of his sets to "walking into a dreamland of visual opulence." Over the course of his career, Sir Ken Adam was nominated for nine BAFTAs, winning two for his work on Dr Strangelove and The Ipcress File in 1965 and 1966 respectively. 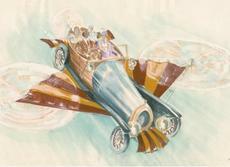 Ken Adam's original sketch of Chitty Chitty Bang BangSome of the most memorable and inspired of his designs include the villain’s headquarters in Dr No (1962) and the iconic Chitty Chitty Bang Bang featured in the 1968 film of the same name. For Adam though, it was the huge triangular Pentagon War Room with its giant poker table and light ring in Dr Strangelove (1964) he was most proud of.